And you think 160 is not enough? And when you know how computers are working, it totally makes sense! “So what?” are you going to ask? So, this is again a nice example of character encodings drive you crazy. According to wikipedia there are 3 encodings used in text messages which respectively use 7bits, 8bits and 16bits to encode a single character. Depending on the characters you used in your message your phone is going to decide what encoding to use, thus reducing the maximum number of characters to, respectively, 160, 140 and 70 (and even less, see later). Any extra character will lead to the splitting of your message into multiple SMS and, obviously, a raise in your bill. If you use only those characters, then you text messages can have 160 characters, however, any character outside of this alphabet will mean the use of a different encoding. And if you are using exotic scripts, your messages will be encoded in UTF-16 and in this encoding a Chinese character, for example, will take up to 4 bytes, reducing the maximum length of you Chinese message to 35 characters max. I guess that now that smart phones are supporting international scripts and transparently breaking up text messages, a lot of people get trapped. The only recommendation I can think of is to enable your phone to display the character count when you type text messages, I noticed that my iPhone is changing the maximum number of characters according to the encoding it’s going to use to send my message. 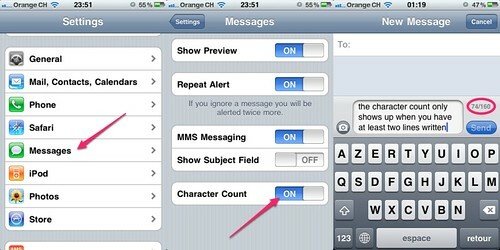 UPDATE: At Stephanie’s request here is how to activate message count on your iPhone (at least on my 3GS with iOS 4.1). This entry was posted in Code & Technology and tagged encoding, iphone, mobile, sms on 2010-10-19 by Claude Vedovini.